Living with allergies is challenging, but you can furnish so that you alleviate some of the challenge. Some common allergens in the home are pet dander, dust mites and pollen, and while it is not possible to get rid of them completely they can be minimized to mitigate the sufferings of those who are allergic to them. Maybe keeping your home clean and dry is the most important step to take when you need to minimize allergens inside a home. Dehumidifiers and air purifiers have a role to play as does temperature control. Another step you can take is discouraging pets from sleeping on your bed. Additionally, any mold should be promptly removed, by professionals if need be. Some common sense precautions include avoiding water stained carpets, ceilings or tiles in a home, and removing them as soon as possible to get rid of pollution sources. In addition to these steps, the furniture and decor you select can play a big role in keeping a home allergy free. Avoid overstuffed furniture and prevent crowding furniture in any area. You should be able to go around the furniture so that you can access all areas of the room to clean it. It is important to get rid of all dirt and debris on a regular basis, and frequent cleaning is essential to keep allergens to a minimum. Make sure to have enough storage in a child's room where toys can be stored to protect them from collecting dust. You may also want to avoid keeping books and collectibles in a bedroom because these can collect a lot of dust. Keep nightstands free of objects so that the air around the bed is clean. Leather and vinyl are probably the best upholstery choices for allergy sufferers. These materials can be cleaned easily, and today you can get leather in a variety of colors and looks. Buying a good quality leather sofa can be expensive, but the investment pays off in the long run. While selecting sofas and chairs, make sure to choose a design where the base is raised on legs and does not sit on the floor. This prevents dust and mold from accumulating underneath. If you must have fabric upholstery be prepared to clean more often than you would with leather. The idea is to get as tight a weave as possible so that particles don't travel through it. Vacuum thoroughly to keep it dust-free. Also remember, organic fabric is not necessarily hypoallergenic. Some materials such as organic wool can still cause allergies. It is best to have bare floors as they can be cleaned easily and thoroughly. Carpets and rugs, on the other hand, can be the greatest repositories of dust. Dense or high piles on rugs and carpets are the worst. Dust settles into the fibers making it impossible to get rid of it completely. If it is not possible to remove the carpet, use a vacuum cleaner with HEPA filter frequently. Throw rugs and dhurries are better than carpets, especially look for those with a low pile or those that are washable. Blinds could quite possibly be the best window treatment for an allergy free environment inside the home but avoid accordion pleated ones. Metal Venetian blinds are better than wood, as wood can also harbor mites. If you must have curtains, use light cotton ones. These have the advantage of being easily washed to get rid of any dust that may settle on them. Completely avoid heavy drapes or ones that pool on the floor. 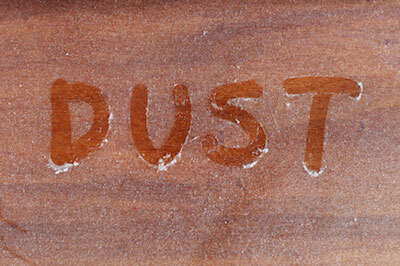 Beds need special attention because pillows and mattresses are also a breeding ground for dust mites. Besides the obvious, which is laundering bedsheets and pillowcases at least once a week, it also helps to encase pillows and mattresses in allergen-proof covers. These covers are available in fabric and also as airtight, zippered plastic coverings that prevent a person from coming in direct contact with them. Better still, you can find mattresses and pillows that are made from hypoallergenic material. It still makes sense to find out what is in your mattress and make sure that you are not allergic to it. Many mattresses do contain latex which could be a source of allergies for some. If you are not allergic to latex, then it might be a viable choice as it doesn't encourage dust mites.